GREENVILLE, Ky. — Unit Public Affairs Historian Representatives from across the Commonwealth attended the annual UPAHR Workshop hosted by the Kentucky National Guard Public Affairs Office this weekend at the Wendell H. Ford Regional Training Center in Greenville, Ky.
“This workshop is an excellent way to engage the units at the company level in order to tell their story,” said Sgt. Major Richard Puckett. Puckett should know. He is the sergeant major for the Department of the Army’s Office of the Chief of Public Affairs out of Washington D.C. He attended the two-day workshop to visit with the UPAHR’s and with the 133rd Mobile Public Affairs Detachment. 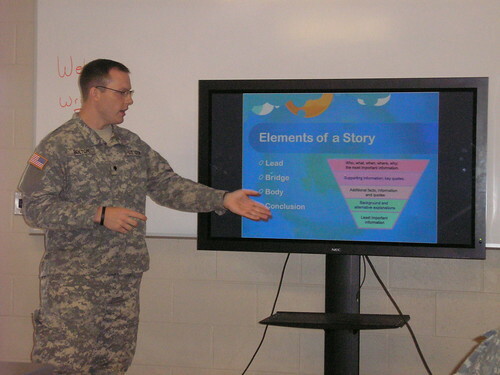 The 133rd MPAD was charged with teaching the Soldiers about the art of public affairs and story telling for the workshop. The Soldiers who attended the workshop were instructed on basic writing techniques, photography and how to interact with the media. Sgt. Bryan Ploughe, from Headquarters and Headquarters Battery, 1st Battalion, 623rd Field Artillery out of Glasgow, Ky, has attended three of the last four workshops held to date. To find out more about the UPAHR program, contact your readiness NCO or email the Public Affairs Office at pao@kentuckyguard.com.